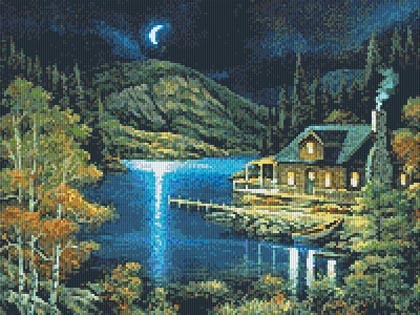 Moonlit Cabin - 15 Baseplate Pixelhobby Kit. Kit Contains: Full Instructions, Design Sheets, Baseplates & Pixel Squares. Image Credit: Artwork of John Zaccheo. Image copyright of John Zaccheo/ Art Licensing Int'l. A 16 Baseplate version of this Kit can also be found here.